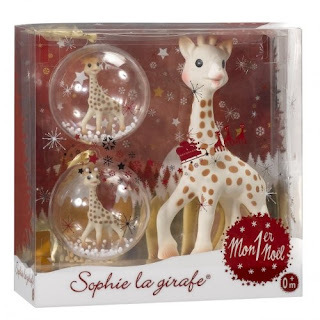 Dainty Baby: Limited Edition Sophie the Giraffe My First Christmas Teether and Ornament Set giveaway! Sophie is so cute, A good reminder of the baby days. For me it was getting to see most of my family in just one day. I also loved the big family meal afterward! Very excited for the holidays this year to celebrate our son's first Christmas! He absolutely adores his Sophie - so much so I think he needs a replacement! My favourite holiday memory was to make the long trek to see our extended family. It was long, but worth it! My favorite holiday memory was the Christmas we brought my Mom home from the hospital after suffering a life threatening and altering stroke of which she spent almost 3 months at a rehabilitation facility learning how to talk and walk over again. She's my inspiration, and having her with us that very first Christmas after all of that brought it home to what REALLY matters in life, family <3. My daighter loves her Sophie and looks for it all the time. My favorite Christmas memory so far is celebrating my first son's Christmas with him. So touching.